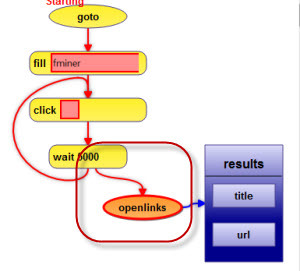 In some cases, you need open more links on a page for different purpose, you can use it. For example, if the "next" link on pages is not a real link, you will need to do "click" action to run some js code to go next page recursively. In order to accomplish this, you can add a "click" action and then add "open more links on page" to open the links on new page. The actions added by "open more links" are same as the actions "open link(s)". The details of "open link(s)" are here: open link(s).